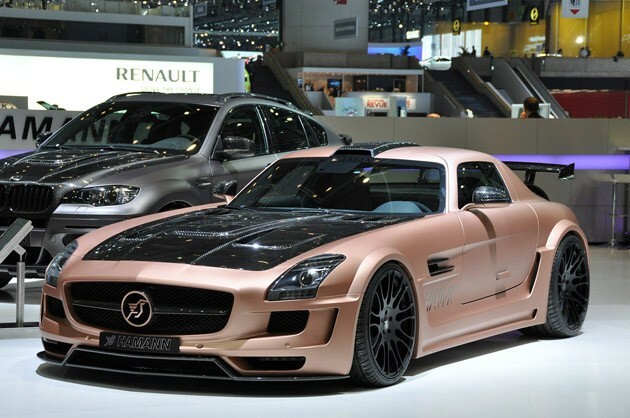 The Mercedes-Benz SLS AMG is certainly enjoying an interesting run at the 2011 Geneva Motor Show. It's had its ups and downs... and right now, it's going through another low point courtesy of Hamann. To be fair, the styling of the Hamann Hawk is almost kind of cool. But the matte pink pearl paint job does this car no favors. Hamann calls the color Everose Gold, but we're going with Barbie's First Supercar - it's like Paris Hilton trying to act tough. What's certainly no act, however, is the work done under the hood. The Mercedes-Benz 6.2-liter V8 in the SLS, which normally produces 563 horsepower and 479 pound-feet of torque, has been pushed to produce 636 hp and 502 lb-ft. This was accomplished through the use of upgraded manifolds, a new exhaust and adjustments to the engine mapping. Those changes help push the Hamann Hawk from 0-62 miles per hour in 3.6 seconds. Hold the go-pedal down and you'll eventually hit 199 miles per hour. Of course, you'll still be driving something that 16-year-old girls would find oddly endearing, like a pair of pajama pants with pink skulls on it. Hamann, please paint this thing black, lose the garish grille emblem, and then let us disappear with your gas card for a few days. Geneva 2011: Hamann Hawk is Barbie's First Supercar originally appeared on Autoblog on Thu, 03 Mar 2011 19:01:00 EST. Please see our terms for use of feeds. It may be pink, but I don't think anyone will be laughing at it once the right pedal is stepped on.